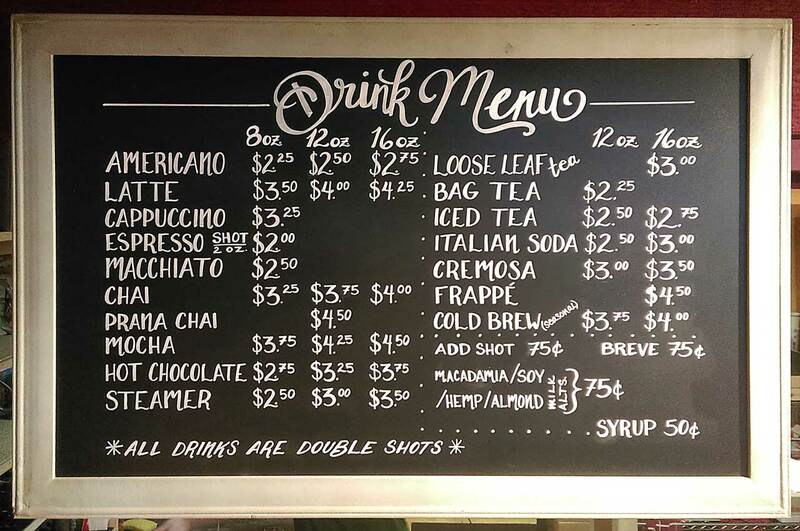 Our cafe menu reflects the espresso drink classics. All of our drinks comes with a double-shot no matter the size. You won’t get cheated out of your caffeine buzz when you order an 8oz. drink! Like to add an extra shot or two to that 16oz. drink? Not a problem. Seasonally we serve cold brew on nitro produced locally by our roaster, Bonsai Beans. If coffee’s not your thing, we have a large selection of tea from Metolius Tea, T’s Tonics, and Jasmine Pearl Tea Company. Maybe you’re a chai lover? We’re the only place in Bend serving Prana Chai- a whole leaf, whole spice blend coated in Australian bush honey, served with Macadamia Nut milk and steeped right at your table. Not too sweet, not too spicy- pure chai bliss. Our beer selection rotates among different Deschutes Brewing Company options and our wines are handpicked for both taste and value by our lovely neighbors at Good Drop Wine Shoppe.